Curated by Shophouse & Co, Of Gardens & Dreams is a public art showcase that celebrates Taman Jurong’s connectedness with nature and the lively spirit of its residents. 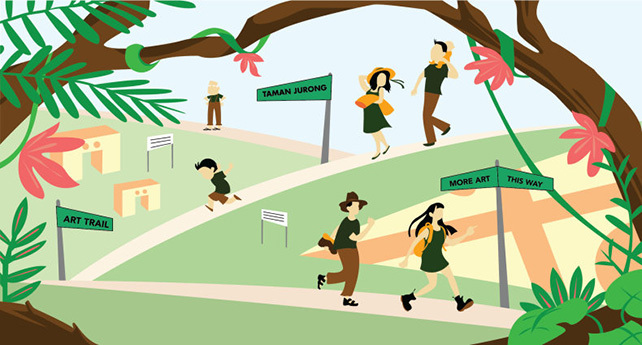 Join us on a visual arts trail through Taman Jurong, where artworks co-created by artists and residents make the neighbourhood come alive! This trail will feature four newly commissioned visual artworks, including two street art pieces from Noise Urban Arts in the Hood programmed by Noise Singapore. All artworks are part of Singapore’s first residential art gallery, Our Gallery at Taman Jurong. You will also hear from the curators and artists themselves about the history of the neighbourhood, the community landmarks that shaped its physical landscape and the unique process of co-creating art for public spaces. Venue: Various Locations around Taman Jurong Neighbourhood.